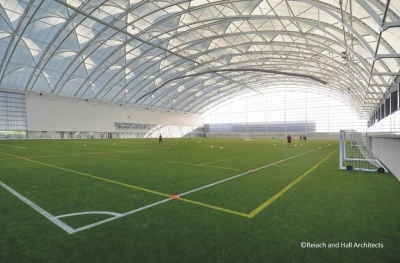 Oriam, Scotland’s new Sports Performance Centre, comprises a full size indoor 3G synthetic pitch for football and rugby with spectator seating for 500 people, a nine-court sports hall, a 100-station fitness suite, as well as a high performance wing that includes areas for hydrotherapy, strength and conditioning, rehabilitation, offices and a classroom. 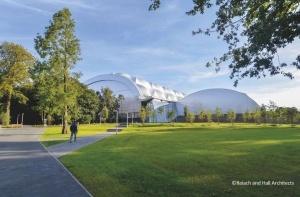 The arch profile for the football hall roof offers a high rise:span ratio and considerable curvature, giving rise to a highly efficient structure with a comparatively low overall weight. The arch is a naturally efficient form allowing the structure to work primarily as axially loaded, with relatively small bending moments generated. Central piers support the ends of the football hall and sports hall arches which converge at a single point behind the listed wall, in an area known as the Street. Initially these piers were conceived as reinforced concrete elements. However, the overall programme advantages of bringing this element within the steel package were explored and, following this review, the steelwork option was selected giving both programme and cost advantages. The roof structure acts as an umbrella over the public fitness area and high performance wing, which are both constructed as conventional steel-framed structures and accommodate the high performance spaces and the public fitness suite, café and accommodation. In the public area the tight limitations on available floor depths meant that cellular floor beams were needed to span the full width of the structure without intermediate columns, leaving the gym and café spaces completely column-free. The same was needed in the high performance wing in order to maximise the column grid spacing and minimise the disruption to the floor layouts. All the steel structural elements were very precisely fabricated to tight tolerances before delivery to site, which enabled a rapid waste-free assembly and a comparatively quiet construction process. This was important as the existing Centre and Academy building needed to remain open during the construction work. Erection procedures were planned in detail using 3D models. The steel-framed structures and regular column grid arrangement for the office, café and elite sports areas are all adaptable for future changes of use. The structural steel was efficiently engineered for fire resistance with the structural elements supporting floors required to achieve a 60 minute fire rating. For exposed elements this was achieved through the use of (high visual quality) intumescent paint. For those which are not exposed, intumescent paint with a basic finish was used. 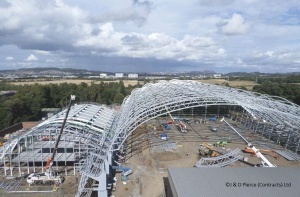 Steelwork Contractor J & D Pierce (Contracts) Ltd.